One thing I love about Summer is the fact that it's perfectly acceptable to have laid back hairstyles. As I'm writing this, the UK is currently going through a heatwave so the last thing I want to do is sit curling or straightening my hair to perfection in this heat. 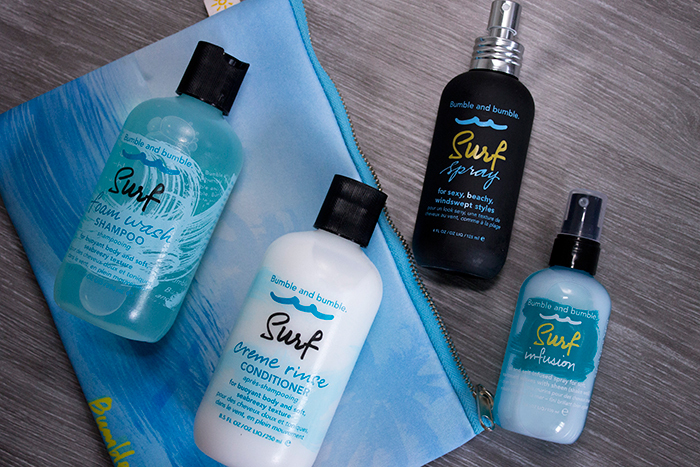 For a beachy inspired look, nothing is more fitting than the Bumble & Bumble Surf Range, to give you those effortless beachy waves. Before I used it I wasn't sure if I'd like the Bumble & Bumble Surf Foam Wash Shampoo. I thought it might be too stripping or make my hair tangly but that isn't the case at all. I'd say it's definitely on the more clarifying side of shampoos but when it's hot and humid outside, it feels so good to wash it all away and have freshly washed hair. I find it's great for volume and sort of prepares your hair for the surf spray. With the nature of the range, I think the Bumble & Bumble Surf Creme Rinse Conditioner is essential. The shampoo on it's own might be a little drying so it's great to reach for this lightweight conditioner to bring back some nourishment to the hair. It's incredibly easy to wash out and leaves your hair feeling silky soft. I've been a big fan of sea salt sprays and the Bumble & Bumble Surf Spray is definitely one of the best. It comes in a sort of rubberised bottle which makes it easy to hold and it sprays very evenly onto the hair. I like to use this on the mid to ends of my hair to create some texture and volume. The salt helps to recreate those beachy waves that you'd achieve from swimming in the sea. It takes a little bit of time and scrunching of the hair but the end result is fabulous. Now a lot of people find the previous Surf Spray a little too drying for them so as an alternative, the Bumble & Bumble Surf Infusion gives the same effect as the Surf Spray but has much more of a conditioning element to it. With the infusion of oil, it gives much more of a shiny finish to your beachy waves. Personally I prefer the original Surf Spray as I find this doesn't hold the waves as well as it's predecessor but it's a great alternative and I haven't seen anything like it. Overall, I'm really impressed by the Surf range. For the full set, I would say it's a little too expensive for your everyday haircare needs but if you feel like treating your hair to something a little more special, it's definitely one to consider. For this time of the year, it couldn't be more perfect.